The PPA and PPB models are only projector mounts that offer ceiling mounting option in one out-of-the-box solution while the PPC model delivers a flexible drop length for ceiling mounted projectors. These versatile, ready to install mount models offer the convenience of installation to the ceiling and provide drop length options without the need of additional accessories. 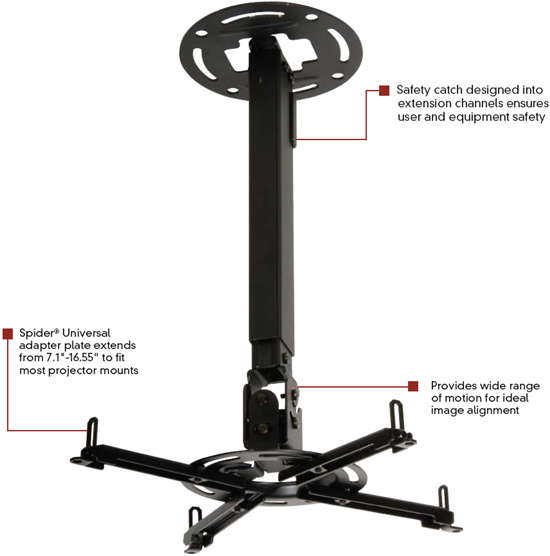 These mount models provide the first true comprehensive projector mounting solution in a single package. PPC(-S)(-W): 6.5" - 16.55" x 23.2" - 37.89" x 6.5"-16.55"